Djam is a master woodcarver from Ghana. He carves masks, figurines, puppets, chairs, beds, stools, drums, and other objects. He is available to teach woodcarving and drum-making to people of all ages and abilities. Djam clearly explains what he does and discusses the importance of carving and drumming in Ghana. He can bring several of his own art pieces, perform for audiences of all ages, teach basic skills, or teach for a longer period at a more advanced level. 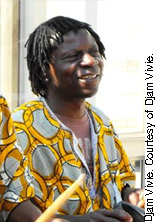 Djam can also provide his own drums to teach basic drumming, West African songs and rhythms, as well as West African stories and games to both children and adults. Will travel within a 50 mile radius of Madison, but is flexible. Available weekdays, weekends. Best to contact during evening hours.